Alberta follows the Alberta’s Fish Conservation and Management Strategy. Alberta’s goal of the long-term sustainability of fisheries is central to this commitment. 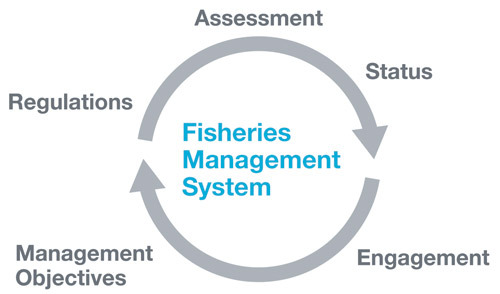 The components of Alberta’s Fisheries Management System are Assessment, Status, Management Objectives, Engagement and Regulations. For more information on Alberta’s Fish Conservation and Management Strategy, please go to Alberta’s Fisheries Management website and click the link. The summary in this section does not contain all regulation changes for 2019 and is provided only for general information to assist anglers in locating important changes. Carefully review regulations appearing in “Site-Specific Regulations” for each Watershed Unit for each Fish Management Zone. Changes to waterbody specific regulations are highlighted blue. Tiger Trout are listed as a sport fish in Alberta. This allows Alberta to define quotas and size restrictions for Tiger Trout. Tiger Trout stockings have also been expanded to more lakes. Please review the Site-Specific Regulations and the Stocking Report. Opportunities to harvest non-trout fish species from put-and-take stocked trout ponds have been restored. For specific information, read about Alberta’s Fish Stocking Program. For easier reading, the Watershed Unit regulations were updated to a table format last year. This year, updates to the guide include improved descriptions in the Legends, clarified possession limits in the regulation tables, and highlighting waterbodies closed to fishing. For a guide to using the regulation tables, please see the “Regulation Tables are Easy to Use!”. 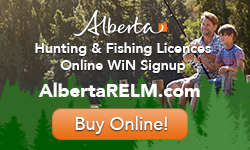 This guide can be downloaded from www.albertaregulations.ca website. Touch the PDF symbol below the cover of the sportfishing regulations to select, download, and save sportfishing regulations for your favourite watersheds (examples ES1, NB3, PP2) OR download the complete document. Definitions of terms and the regulations for the use of bait have been clarified. The management frameworks for walleye and northern pike recreational fisheries were updated last year. Overall, these changes result in increased harvest opportunities at healthy fisheries and conservation-based regulations at fisheries that need some help. Updated regulations are highlighted in Fish Management Zone sections. Please see Site-Specific Regulations for the waterbody you want to fish. Angling through ice is not permitted into beaver ponds or into flowing waters. This is also a reminder that ice fishing can be dangerous and for more information see “Use Caution on Ice”. The definition of a river mainstem has been clarified; click here. There is a new stocked pond and sportfishery in ES3! It is Lodgepole Pond (01-48-10-W5) and it is located 30 km southwest of Drayton Valley. It is open all year and bait except bait fish is allowed and you can keep 2 trout of any size. It is scheduled to be stocked this coming spring. To allow the fish populations to recover, following a spill of chlorinated water into the Nordegg River in the fall of 2018, all streams in the Nordegg River watershed and the Brazeau River downstream of the Brazeau Dam are catch and release. Aquatic invasive species, including fish diseases, continue to pose a serious risk to Alberta’s fisheries and their impacts can extend well beyond reducing recreational fishing opportunities. We all play an important role in keeping Alberta’s waters healthy. Alberta is committed to minimizing the impacts of all aquatic invasive species, as they can be unknowingly spread through the movement of water and mud between waterbodies. Prevention is our best response effort, followed by containment if an invasive species is detected. 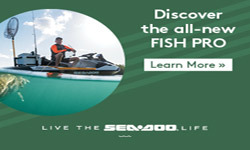 Everyone can actively help stop the spread of aquatic invasive species by taking action to CLEAN, DRAIN, and DRY YOUR GEAR after each use to ensure no water, mud, fish or fish parts are moved from one waterbody to the next. This remains important both within Alberta and beyond our borders. Prevent the Spread of Invasive Fish Species: Invasive species like goldfish and Prussian Carp have been illegally released into various waters in Alberta and have established breeding populations. They pose serious threats to native fish species and aquatic habitats. 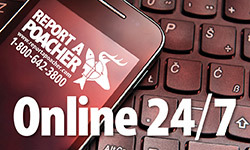 If you observe or catch an invasive fish species please call the 24/7 hotline. Of particular concern to fish health is whirling disease, a parasite that infects salmonids, and is now found in the Bow, Oldman, Red Deer and North Saskatchewan watersheds. Whirling disease can spread naturally, but also through the movement of spores on gear, infected fish and fish parts. Avoid using felt soled waders and dispose fish parts in the garbage can help to prevent further spread. ●	It is prohibited to possess any of the 52 aquatic invasive species listed in the Fisheries (Alberta) Act. This list includes fish, plants and other species like mussels and snails. ●	It is mandatory for anyone transporting a watercraft to stop at open watercraft inspection stations and cooperate with officials. This includes motorized, non-motorized and commercially hauled watercraft. The fine for bypassing an open inspection station is $310. ●	PULL THE PLUG! All watercraft being transported in Alberta must have the drain plug pulled while in transport. The fine for not pulling the plug is $172. ●	DON’T LET IT LOOSE - Never release aquarium or domestic pond water, plants, dead or live fish or any other animals into waterbodies. ●	STOP THE SPREAD – Never move live or dead fish, or fish parts from one water body to another and do not use live fish as bait. Fines can be applied for moving, possessing or importing invasive species, listed or prescribed. Fines can be up to $100,000 and/or up to 12 months in prison. 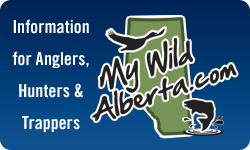 www.alberta.ca/fish-wildlife and search “Invasive Species” or “Whirling Disease” to learn more. Alberta Environment and Parks conducts public reviews of various recommendations made by anglers, sportfishing organizations and staff. You are encouraged to send any comments to the address below. Your letter or e-mail will be sent to the appropriate fisheries personnel and advisory committee for review. Because of their vulnerability, Alberta Environment and Parks has implemented a zero possession limit on Arctic Grayling, Athabasca Rainbow Trout, Bull Trout, Westslope Cutthroat Trout and Lake Sturgeon. PLEASE release these species immediately. NOTE: Some fish are easily confused with at-risk species. If you can’t identify a fish, please release it!